Rinse the quinoa. Bring quinoa and water to the boil in a medium sized saucepan. Reduce heat and gentley simmer for 5 minutes. Add the apples, raisins and cinnamon. Simmer until the water has absorbed. While the quinoa is cooking, toast the nuts in adry pan for a few minutes. 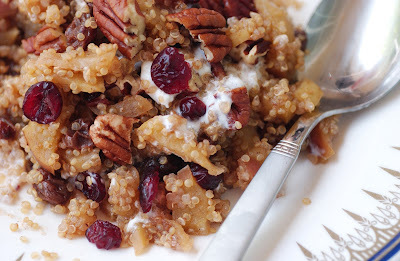 Transfer to serving bowl and sprinkle cranberries and nuts over the quinoa. Serve with dollops of yoghurt or cream and sweeten with honey/agave syrup if desired.